In 1759, John Patterson arrived in Loudoun County as the land agent of Charles Bennett, the Earl of Tankerville. Patterson bought and sold land in Virginia on behalf of the earl and collected rent from his tenants. In 1761, he purchased this lot from Nicholas Minor. After losing his position with the earl in 1766, Patterson remained in Leesburg where he made a living as a merchant in partnership with his brother Fleming. In the early 1770s, Patterson died deeply in debt and his brother was forced to sell much of his property. A 1776 Loudoun County court document mentions "Mr. Patterson's stable" at the eastern end of town lot #12, but does not mention any other building. While Patterson may have constructed a dwelling or store here as well, it is more likely that the large stone structure that stands today was built as a tavern by Henry McCabe in the 1780s. The size of the building is consistent with use as a tavern. Henry McCabe probably acquired the property from his father in the early 1780s. 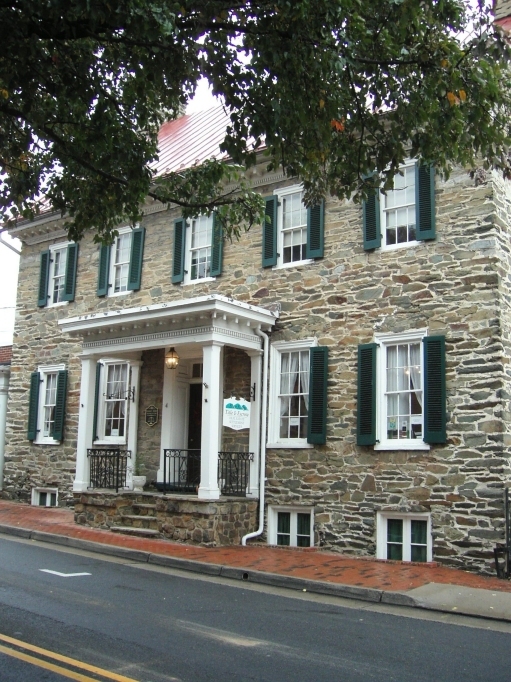 His father, a resident of Alexandria, had loaned a great deal of money to John Patterson while he was till alive, and subsequently acquired much of the latter's property in Leesburg. Although the earliest reference to the stone tavern appears in an insurance policy that McCabe took out in 1796, he may have built the tavern shortly after moving to Leesburg in the early mid-1870s. By 1787, Henry McCabe held a license for an ordinary in town. Henry McCabe dies between 1796 and 1810, and his widow Jane closed the tavern before 1816. She continued to live in the former tavern, and during the 1840s and early 1850s, shared the house with her son Joseph, who was a carpenter; her daughter-in-law, Amanda; and her grandchildren. Later owners include Rev. and Mrs. George Addie, Mary Mead, and the Worsley sisters, Frances and Lizabeth. Lizzie Worsley is remembered for writing a history of St. James Episcopal Church in Leesburg. Local lore recalls that General Lafayette during his 1825 tour of nearby Belmont, Oak Hill, Coton plantations stopped in Leesburg and the welcoming address was made from the steps of this local landmark. Reputedly, the sketches of people in nineteenth-century clothing on the walls of the attic stairway were drawn around the time of Lafayette's visit. The five-bay building with a center-hall plan exhibits the proportions, symmetry and ornamentation, such as the modillion cornice, of the Georgian style. The entry porch is a Colonial Revival addition.